When you’re looking for a cost-effective flooring material that’s just as versatile as it is durable, come to Cloister’s Flooring America and browse our assortment of luxury vinyl flooring in Lititz, PA. We are proud of being the area’s most recommended flooring showroom. 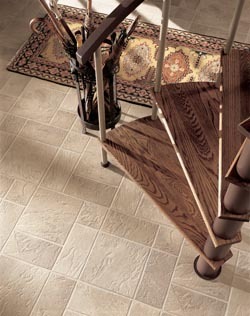 Our dedication to total customer satisfaction is matched only by our extensive flooring inventory. With a full selection of luxury vinyl tile from the industry’s most respected manufacturers, we have distinguished our showroom as the one that more residents prefer. Find out why more and more property owners go with luxury vinyl by talking to our knowledgeable and friendly associates. Explore the highly sought-after varieties of luxury vinyl we have in our inventory. This state-of-the-art material creates particularly beautiful floors that have a pleasant feeling that you are sure to appreciate after a long period of standing. Vinyl tiles are the sophisticated way to cover your floors with style and elegance. When you want the realistic look of slate or marble, vinyl flawlessly imitates these natural surfaces. For all its versatility and variety, it’s no wonder that vinyl is one of the best-selling flooring options available today. Our vinyl products duplicate the natural color and appearance of real wood, stone, and ceramic without stretching your remodeling budget. Our priority is to create a pleasing shopping experience from start to finish. Once you’ve decided which type of luxury vinyl works best for your property, we take care of the rest. With our exceptional installation services, you can be confident that your new flooring will be correctly installed for optimal attractiveness and product longevity. Start your home improvement project today by stopping by our showroom for our exciting flooring options. With the exceptional flooring you’ll find at our store, your home will look outstanding for many years to come. Contact us for an estimate on luxury vinyl flooring. Our flooring showroom in Lititz, Pennsylvania, serves customers throughout the area of Hershey, Elizabethtown, Reading, and Marietta.